Want to feel like you are in Hawaii? Then go buy a Pineapple. These great exotic fruits have a way of transporting you, through your tastebuds, to an island far away. I have never been to an island far away so this is the closest I’ve got! Pineapples have exceptional juiciness and a vibrant tropical flavor that balances the tastes of sweet and tart. They are second only to bananas as America's favorite tropical fruit. Although the season for pineapple runs from March through June, they are available year-round in local markets. But lucky you, this is the best time of year to get them! The area closer to the base of the fruit has more sugar content and therefore a sweeter taste and more tender texture. Pineapple is an excellent source of vitamin C and manganese. It is also a very good source of copper and a good source of vitamin B1, vitamin B6, dietary fiber, folate, and pantothenic acid. Pineapple can be left at room temperature for one or two days before serving. While this process will not make the fruit any sweeter, it will help it to become softer and more juicy. Yet, as they are very perishable, you should still watch them closely during this period to ensure that they do not spoil. When selecting a Pineapple it should be free of soft spots, bruises and darkened "eyes," all of which may indicate that the pineapple is past its prime. Pineapple stops ripening as soon as it is picked, so choose fruit with a fragrant sweet smell at the stem end. One cup of pineapple has 70 to 85 calories. 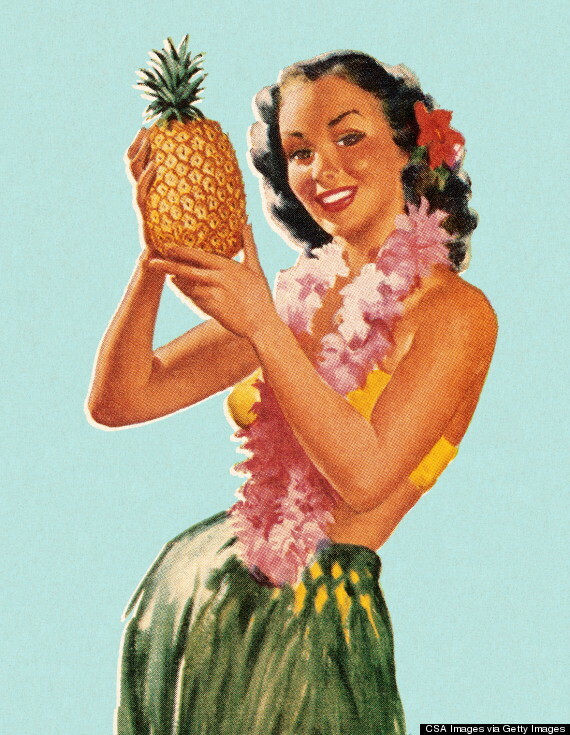 Historically, Hawaii was the world's largest pineapple producer and source for U.S. pineapples. Today the largest producers include the Philippines, Brazil, and Costa Rica. You can grow a pineapple plant by twisting the crown off a store bought pineapple, allowing it to dry for 2-3 days, and then planting it. Now, many of us will cut up a pineapple and then throw away the outer shell and awesome spikes. DON’T DO IT AGAIN! Make that amazing fruit into the bowl you serve your dish in. What a great way to reuse and recycle the very thing you are eating and enjoying! I love seeing food served in food and the clever ways it can be displayed. The outer shell of a pineapple is so beautiful and it is such a pity to waste it into the trash. A pineapple shell could be used to serve the cut pineapple in or make a mixed fruit bowl in it, it can be used to make a cup for a smoothie (standing upright), it can be used as your own personal bowl with your meal in it….be creative and use the whole pineapple in a meal. It also can add some flavor into whatever you serve in it. I love this clever idea of a Teriyaki bowl! 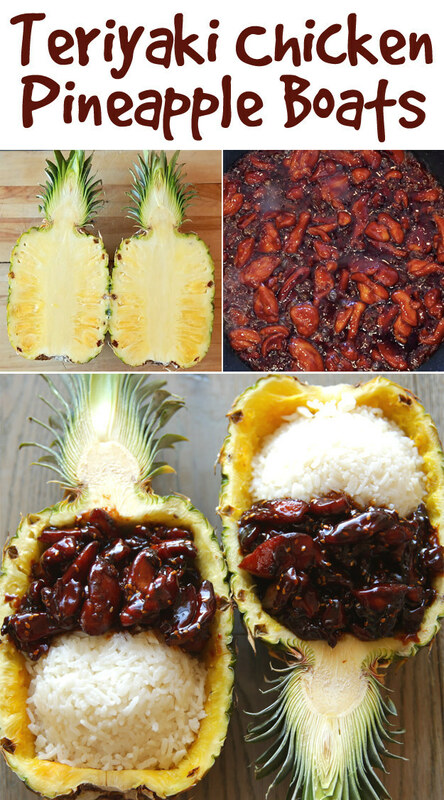 Just serve up your cooked rice and chicken teriyaki right in the pineapple and sprinkle some cubed pineapple on top. This is sure to impress anyone at your meal table! Hurray for this incredible fruit, now go buy a pineapple and enjoy some “Hawaii Time”. Cut pineapple in half, lengthwise. 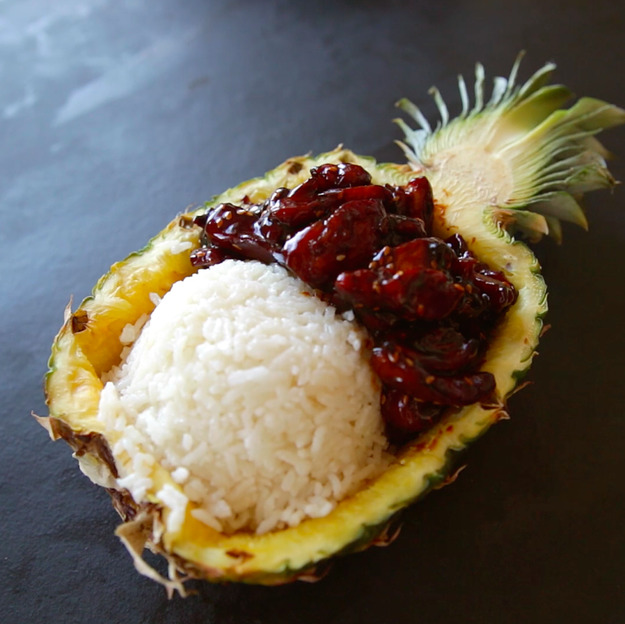 Use a spoon to scoop out the flesh of each half, leaving about a half-inch on the sides to make sure the pineapple boats are sturdy. Discard the flesh or set it aside to eat later, and drain any juices. Heat the oil in a large skillet over high heat. Add the chicken thighs and cook, stirring occasionally, 2 minutes. Add soy sauce, brown sugar, and honey, and stir to combine. Bring the mixture to a boil, then turn the heat down to medium-low and cook, stirring occasionally, until the sauce is thick and the chicken is cooked through, 8 to 12 minutes.